Off-Piste Agri Ltd was formed in 2013. We originally set out to find a safer and more efficient format to ensiling our own 30,000t clamp. 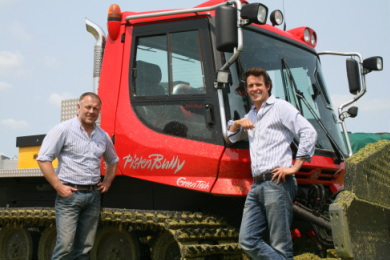 We looked to Germany (world leaders in AD and ensiling) and discovered the PistenBully GreenTech manufactured by Kässbohrer. The PistenBully is a highly versatile machine, ranging in size and power and can be used on the most sensitive of environments. Its combination of low ground pressure and high power ensures it can operate where wheeled machinery can only dream of going! We hold a full range of spare parts at our site in Suffolk and have a team of fully trained engineers available 24hrs to cover the whole of the UK, if there is a problem.